Our visit to Shenandoah National Park this year was extremely enjoyable (mentally not physically!) relaxing, and cooler than back here in Central Florida (highs there in the 70s). It was also interesting from a photography perspective and different from last year’s trip. I did a lot of sunset / night photography and didn’t try very hard to get up early every morning for sunrise. We were fortunate with seeing conditions on the night we arrived. There were no clouds, and the Milky Way center was above the horizon for about two hours after moon set. Shenandoah has dark skies and the large cleared meadow near the lodge provides wonderful views all around the compass. Lynn hadn’t ever really seen the Milky Way before and I’ve never seen it this well. We were both amazed, and I was also impressed with how much detail my Nikon D800 was able to capture. Big Meadows Milky Way. Three frame panorama, 24mm lens, manual focus and exposure, ISO 2500, f/1.8, 20 seconds. Lynn is a big fan of meteor showers, and due to a gravity assist from Jupiter, the Perseid was predicted to be spectacular this year. We set the alarm for 1am the night it was forecast to peak and went out to watch. The area around Big Meadows was crowded with over a hundred people watching the show, and each overlook had cars parked with more people observing. It was a good show. Here’s one of my photos from that morning. A Perseid Meteor and a cloud in front of part of the Milky Way and the Andromeda Galaxy – From Old Rag View Overlook on Skyline Drive in Shenandoah National Park. 24mm lens, manual focus and exposure, ISO 3200, f/1.8, 20 seconds. I tried sunset photos on most nights. The sky wasn’t as dramatic as I’ve seen it in the past, but there were many wildflowers in bloom helping to make up for that. The end of the day – Looking out over Shenandoah Valley from Skyline Drive. The wildflowers were beautiful when we were there. Two frame composite, manual masking in Photoshop. And storms also added interest. We watched this one develop from the balcony outside our room at the lodge. Shenandoah Storm – A storm built up to the west at sunset. As seen from our balcony at Big Meadows Lodge in Shenandoah National Park. Multi-frame panorama. 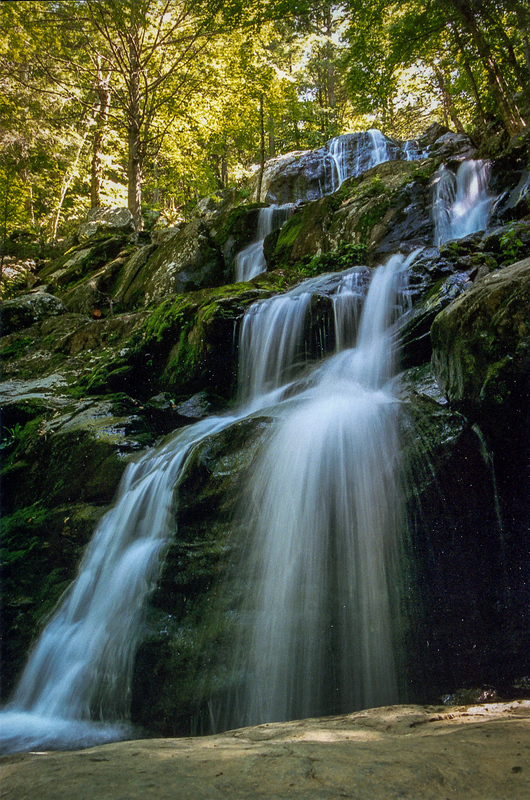 Dark Hollow Falls is one of the most popular places in Shenandoah. When we drove by on Sunday, the parking area was overflowing with cars. We waited until the next morning to hike down. Last year, I didn’t make it to these falls and used one of my 20-year-old photos to illustrate it. For some reason, the hike (especially the return up from the falls) is more difficult than it was when I was 20 years younger. Hmm – I wonder why? This is from very near the same place, and a horizontal, wider view. I like this one too. Dark Hollow Falls. 14mm equivalent FOV, ISO 100, f/8.0, 1/13 seconds, Olympus hires mode. We did a bit more hiking this year than last and went on trails we hadn’t tried before. Rose River Falls and Black Rock Mountain were two new favorites. Another one we hiked was Pocosin Trail. It was interesting, although I didn’t like it as much as the others. Maybe it was because of one sentence in the trail guide: “Soon the trail flattens.” It never did! You can see larger versions of the photos above by clicking on them and more photos from Shenandoah in this album on Flickr.